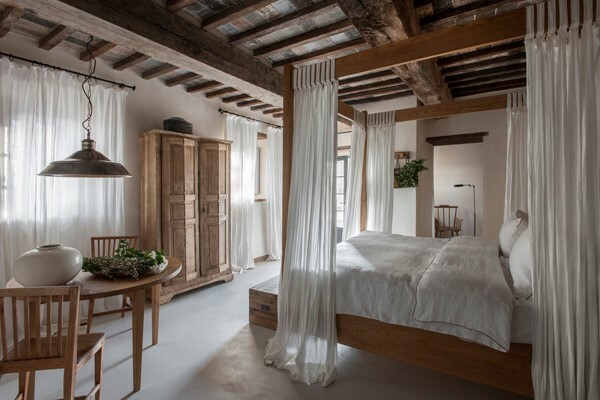 Romance and relaxation are on the cards at this picture-perfect boutique hotel, whose rooms and villas are dotted around a living and breathing Tuscan hamlet. Surrounded by terraced gardens filled with beautifully scented flowers, it’s the perfect spot to kick back and enjoy a rosemary martini or two as you watch the sun set over the Val d’Orcia. The local area is ripe for exploring, too. 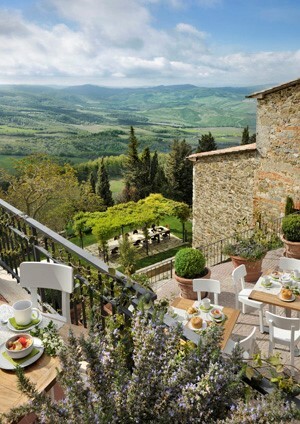 Monteverdi sits 2,000 feet up on wooded slopes criss-crossed by hiking and biking trails, while bustling Montepulciano, pretty Pienza and magnificent Siena are all within an hour’s drive. 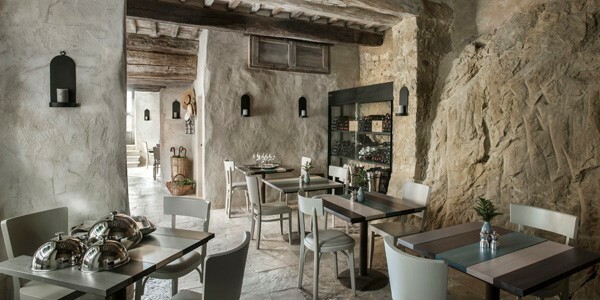 Rooms: The layout and décor of the rooms vary, but all have stone walls and rustic beams complemented by soft colours, fine linens and high-quality furnishings. You’ll certainly feel spoilt in the 3 Luxury Rooms with their kingsize beds and rain showers, but upgrading to a larger room or suite is well worth it. All have special features – maybe a stunning copper bath or an outside dining area. 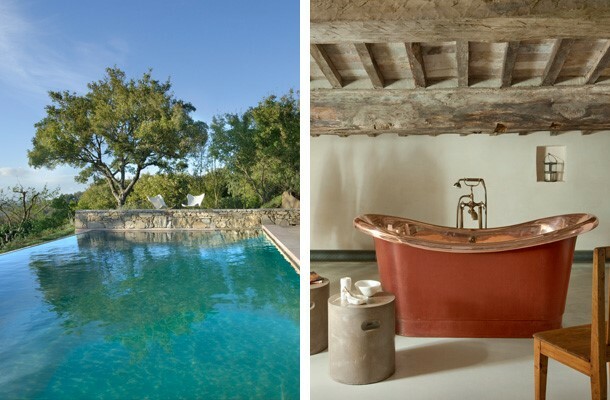 The 3 villas (with 2, 3 and 6 ensuite bedrooms apiece) have living rooms and state-of-the-art kitchens as well as some luxurious additions: a steam room in Amiata, spa tubs in Amiata and Muri Antichi, and wine cellars in Muri Antichi and San Pietro. Very grand! Food: The food here is a real highlight, best enjoyed on the outdoor terrace with a view over the valleys where most of the ingredients are sourced. During our stay we enjoyed pecorino cheese from Pienza and prosciutto from Siena, alongside nettle gnocchi and a very special wild-boar ragù on homemade rosemary pappardelle. Each meal left us feeling very full and very content. A post-dinner drink in the Library Bar finished the evenings off perfectly. Author’s tip: Chat to the enthusiastic staff about their favourite places to explore in the area. Often the smaller towns are more authentic in terms of food and atmosphere, as their shops and restaurants aren’t catering to hoards of tourists. A pizza in Siena’s main square is disappointing compared to one made fresh in Pienza or Montepulciano. Note that things are far pricier in the larger towns too, so try gelati and shop for wine and cheese in the less touristy zones.